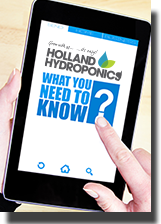 Find a variety of pH and EC pens and meters at Holland Hydroponics. Our pH pens and meters allow you to easily manage your nutrient solution. EC pen for measuring the strength of your nutrient solution. This Pal Plus pH Tester is an easy and accurate way to read the pH level of nutrient solutions, which when growing plants, should be in the region of 6.5. 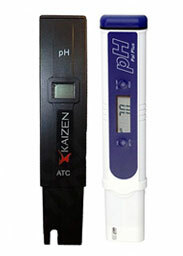 This pH meter is simple, reliable and water resistant. The Nutradip Tri-Meter Continuous Monitoring System (CMS) allows you to monitor pH level, total dissolved solids (TDS) and temperature all at the same time, with consistent and accurate results. The Budget EC pen is an easy to use digital water meter. It measures the electrical conductivity (EC) and also has a thermometer to measure the water temperature. The EC range is 0-9990 µS and the temperature range is from 0-80°C. This 2-in-1 Bluelab pH Pen will measure the temperature of your solution, as well as the pH reading.This handheld pen gives you a quick and easy way to check both of these measurements, coming with a backlit LCD display for easy reading. Accurately measure your pH solution with the Bluelab pH Meter. Handy three in one unit. The Bluelab EC Pen is a compact, quick and handy tool for measuring conductivity and temperature. It simply lets you know whether your plants have the right amount of nutrient in your solution and tells you if adjustments are required. All in one pH, conductivity and temperature meter.